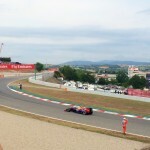 Spanish Grand Prix Review by Miss Bubbles! 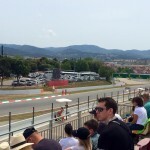 Spanish Grand Prix Review by Miss Bubbles! 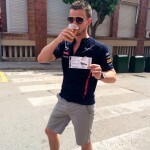 Spanish Grand Prix Review by Miss Bubbles! 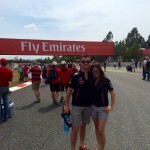 “This past May I decided to surprise my husband with a trip to the Spanish Grand Prix to celebrate his upcoming 30th birthday! Since we’re both F1 fanatics it was the perfect gift. The last time I attended a race in Europe was the Hungarian Grand Prix back in 1997 so I was very excited to be attending another race on European soil. 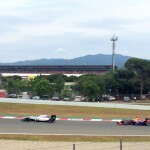 The Spanish Grand Prix is held every year at the Circuit de Catalunya in Montmelo, about 30 km outside Barcelona. There are buses and trains that take fans to Montmelo station & from there it’s about a 40 min walk to the track. You can hop on the shuttle buses as well but the great thing about walking is all the local restaurants, shops and bars that open their doors to the thousands of fans heading to and from the circuit. You can get anything from water & beer to delicious homemade sandwiches along the way! There are also many kiosks selling F1 merchandise. My husband and I flew into Barcelona a few days before the race so we could spend some time enjoying everything this amazing city has to offer. I booked our stay at Amnister Apartments just off Barcelona’s most popular street La Rambla and even though it was during F1 weekend I found many hotel prices to be very reasonable. Amnister Apartments was a great choice as each spacious apartment came equipped with all the amenities, including a kitchen and washer/dryer. And the best part was being mere steps away from shopping, restaurants, the port and old town. Not to mention the most amazing fresh food market I’ve ever visited: La Boqueria. The food in Barcelona is incredible & many restaurants & tapas bars definitely stood out: Sensi Tapas, Can Paixano & Numeronueve to name a few. 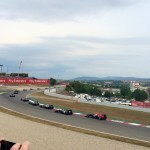 Because the Circuit de Catalunya is outside the city, we decided not to attend the qualifying session and therefore just bought tickets for the race. We actually ended up watching qualifying at one of the many tapas stands in La Boqueria while enjoying fresh seafood dishes and beer! Our tickets for race day were in Tribune N, which is only available on Sunday, and the seats were great! What I did notice about the circuit was the huge amount of grass seating for those with general admission tickets. So if you’re not as willing to spend more money to sit in a grandstand then general admission is for you and the views of the track are awesome! The race itself was pretty exciting! 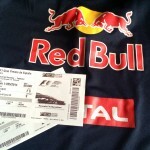 We were in our Red Bull Racing gear cheering on Sebastian Vettel. He finished in fourth place behind his teammate Daniel Riccardo who managed a podium finish in third place, with Nico Rosberg in second place & Lewis Hamilton taking the win. When the race was over we walked the track and even took pictures with some of the Spanish race marshals. The only downside was that the Spanish Grand Prix was the first time we heard the new V6 engine. and being an F1 fan for so many years I’ll be the first to say bring back the noise of the V8’s!! Aside the lack of engine noise and the fact that Mercedes is a big step ahead right now the rest of the racing has been fantastic this season. So happy for Sir Frank especially. Go RBR but Daniels our man. Ha ha.